Disclaimer: This Mathematics question is purely created for discussion purpose. Any resemblance to actual questions from books or schools is coincidental. Q: The sum of three numbers is 125. The smallest number is 25. The difference between the largest number and the smallest number is 35. Find the second largest number. A: Method 1 — This is a common question for Primary students in Singapore. 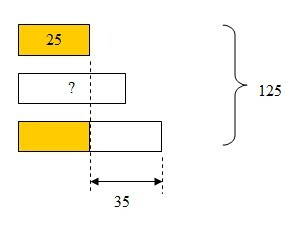 First you need to draw the diagram to show the relationship of the three numbers, based on the question. Once you get the diagram correct, that means you have understood the question and it is easier for you to find the answer. To find the second largest number, you need to subtract the smallest number and the largest number from the sum. Method 2 — Use variables to represent the three numbers, a = the smallest number, b = the second largest number and c = the largest number. Method 1: Pro — This method is taught in school. As long as you get the diagram correct, you are not far from the correct answer. Con — If the student cannot understand the question and unable to draw diagram, the student will leave the answer blank, which leads to zero mark. Many parents have not been taught about this method when they were studying. This is when both parents and students are at a loss because parents are unable to teach the children how to solve the question in “school way”. Method 2: Pro — If you are good at algebra, this is a good method to use. Parents are able to teach the children how to solve the question. Often, the parents are afraid to teach the children this way because it is not the way how teachers teach in school. No worry, the students are actually encouraged to use different ways to solve problems, as long as they can find the correct answer. Con — Algebra is a more complicated concept than diagram, thus some students may not get used to the idea of variables. If the students learn two methods at the same time, they may get confused. Note to parents: Algebra will be taught in Secondary schools. Thus, if your children are able to solve the question using the model method, you may want to introduce the algebra method to your children as an alternative way to solve the question or to check whether the answer is correct. By Wendy in Mathematics on 26/04/2013 .